Follow the Steps from Google. Either manually entering or by dragging the map around, set the map center and zoom you require. Press Copy, and the past the snippetwhere it is required. Remember to replace the Google APIKey above with in the code snippet. 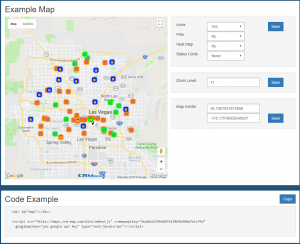 CRM-Map only supports one map per page currently.